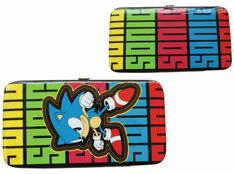 Even more Sonic the Hedgehog accessories! Accessories are wearable, but non-clothing items.They're usually not that big, and can be great to collect. If it's not directly clothing, it shows up in accessories. These are a pretty even mix of old and new for your viewing fun. If anything is currently available in a store, or online, the entry will mention it to help you find it. Accessories are still being made today, and there are still more vintage ones left to find, so keep on the lookout to collect them all. 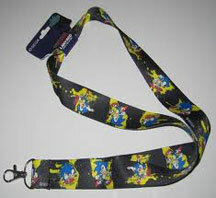 These are Sonic glow bracelets/necklaces. They're plastic tubes with glow chemicals inside. But how are they actually "Sonic themed" beside having him on the box? These were listed as a party favor/party item, but they could really just be for anything. These may be found at Party City stores online or off. This is a classic style wallet made by Bio World. 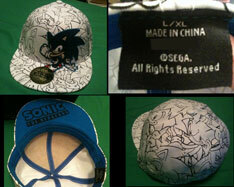 It's the usual faux-leather, but this one has a Sonic face emblem (likely metal/enamel of some kind) on the front. The background is just blue rays, but it adds interest. 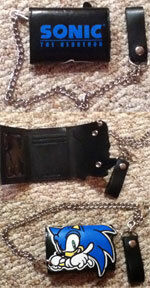 As is usual for them, it comes with a long chain & clip/strap. Notice the "20th Anniversary" symbol on the card. 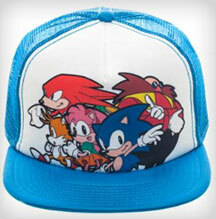 You can find this at Spencers Gifts in 2011, and it should be around 17.99. 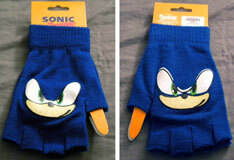 Left photo by: , Right photo by Static the Hedgehog. 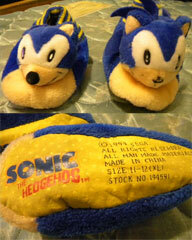 Here comes another pair of Sonic plush face slippers. 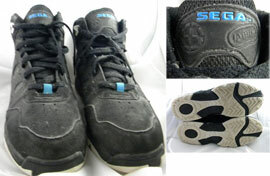 Whatever company/s are seeming to turn out several pairs a year whether anyone wants them or not. This pair features classic Sonic plush doll heads without most of the spikes (so a foot will fit in) However, this time, the face is styled to winking so they're a little different from before. 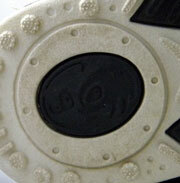 The classic logo is embroidered where the heel would go on the slipper. 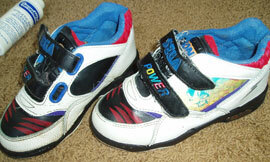 These are available at Spencer's gifts stores for 14.99 in 2013. 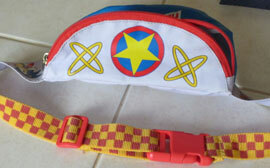 This is a "Trucker Hat" type cap. 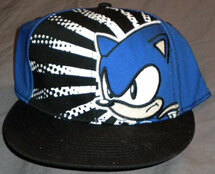 It's a certain style/variation on a baseball-cap like hat. The front panel is solid, while the rest is a screen/net type fabric with open weave. The bill is also usually shorter than that of a ball cap. The style isn't for everyone, (it can make heads look tall) but the pannel provides a nice big place for art. 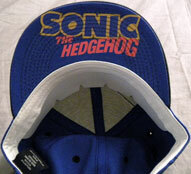 This comparison photo shows the open weave of the back of the hat, how the brim & top compare to a regular Sonic cap & reveals the little classic logo on the back. The tag looks like its from Bio World. Cap compare photo by Crystal Sonic Fan. 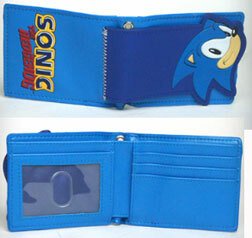 This is a "pocketeer" wallet. It's a wallet type invented to show off. When you put it into a flat pocket (like the back of a pants) that dark blue flap with Sonic face you see there clips over the outside of the pocket so everyone can see it. 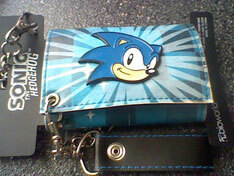 There are other branded character wallets in this style (example: a pony's tail, etc) The wallet itself is pretty plain, all blue with just the classic logo on the other side. The interior has several card pockets & 1 clear one for ID. 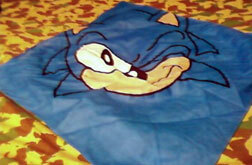 This can be found at Spencers Gifts and likely other retailers in 2013.